An XML sitemap is a great addition to any SEO campaign and is particularly important for ecommerce sites. Maintaining a sitemap helps to ensure that each and every product is indexed by major search engines and available in search results. While XML sitemap files are relatively simple, creating and maintaining a sitemap for many products and pages can be tedious and time consuming. To make the process simple and easy for your AspDotNetStorefront shopping cart, our XML Sitemap Generator automatically creates a properly structured XML sitemap file for your shopping cart, listing all of your products and pages for reference by the major search engines. This add-on is a great convenience for smaller ecommerce sites and an absolute must for shopping cart systems with dozens, hundreds or thousands of products and pages. The XML Sitemap Generator will even manage multiple sitemap.xml files for ecommerce sites that exceed the URL limit per sitemap. Designed for total flexibility, our XML Sitemap Generator creates a sitemap file specific to your needs. Set custom <changefreq> and <priority> values for each entity, product and topic or keep the optimal default settings. Your sitemap can also optionally include Categories, Departments, Manufacturers, Distributors, Vectors, Genres and Topics. We’ve also included references for product images, adding even more SEO punch! 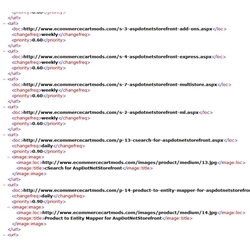 See an example of the XML Sitemap Generator at work with our EcommerceCartMods.com sitemap. Response:There are 3 ways to do this: 1)	Setup our generator to create the files into your /images directory instead of root web a. This will already have all the permissions b. You will need to update Google Webmasters to point/look for the sitemap1.xml in the /images instead of root 2)	OR you can allow IUSRs write access to the web/root (NOT RECOMMENDED) 3)	OR what we do: manually upload/create an empty sitemap1.xml into the web root and set its permissions (only that file’s) to have IUSRs write capability. Response:Yes, it works across multiple domains and has a domain/store selector. Yes, you only need 1 license to use this in the Admin for all your stores. Yes, this module splits the XML Sitemaps into multiple files based on the max of 45k links per file and can be changed to a different count as needed via AppConfig. Response:Thank you Tina. It's an administrative page that one has to execute/process, but it could be made automatic on some load even if needed (like Reset Cache) with some extra development time. Great product! Very easy to install and use! Works wonderful! Very easy to install and get working!